Buckle depicts "CS" and is surrounded by eleven stars, representing the states of the Confederacy. Plate is cast, hooks were originally cast straight up, then bent into place once the casting was removed from the mold. These plates are noted for poor workmanship, and almost all of them have a major casting flaw in the very center of the buckle. Ref: Mullinax Expanded Edition, Plate 159. 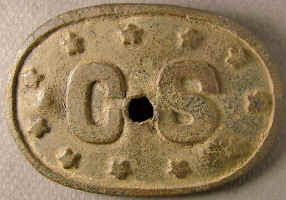 P0415...Confederate oval belt plate, CS, with eleven stars, cast, Confederate wartime manufacture. Buckle depicts "CS" and is surrounded by eleven stars, representing the states of the Confederacy. 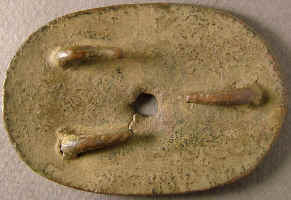 Plate is cast, hooks were originally cast straight up, then bent into place once the casting was removed from the mold. These plates are noted for poor workmanship, and almost all of them have a major casting flaw in the very center of the buckle. Plate measures 50.2mm X 75.2mm. Dug plate, the casting flaw in the center eventually became a hole, likely a soldier started messing with it and eventually poked something through it. Buckle is whole, there is a crack around part of the C that has been filled in. Recovered: by Sam Kinsey in 1992 from Calhoun, GA, the original discovery was published in the NST Vol XIX, No 3, May - June 1992, pg 8.